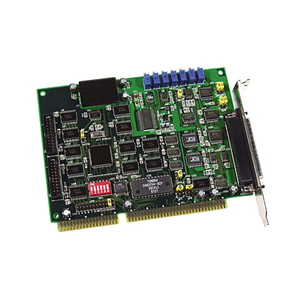 The OME-A-822PGH/L are 12-bit multifunction analog and digital I/O boards for PC/AT compatible computers. The OME-A-822PGH/L offers 16 single-ended or 8 differential analog inputs, plus two channels of analog output with 12-bit resolution. In addition,the OME-A-822PGH/PGL has 16 digital inputs, 16 digital outputs and one counter/timer channel. The OME-A-822PGH provides gains of 0.5, 1, 5, 10, 50, 100, 500 and 1000 while the OME-A-822PGL provides gains of 0.5, 1 ,2, 4 and 8. It has a maximum sampling rate of 125 KS/s, DMA operation is jumper selectable for levels 1 or 3. Interrupts are jumper selectable between 3 and 15. 참고: Includes utility software and complete operator’s manual on CD ROM.